The fifth annual U.S. Opportunity Index shows that access to opportunity has increased nearly 9 percent nationally since 2011, reflecting a dramatically improved post-recession employment picture, higher high school graduation rates and a significant drop in violent crime, among other factors. Despite these gains, increasing poverty and income inequality combined with stagnant wages continue to impede progress for middle and lower income communities. 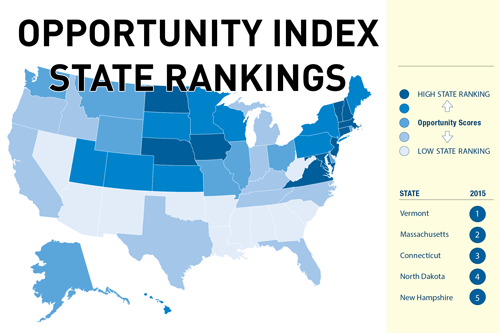 Over the past five years, all 50 states and Washington DC and three-quarters of counties have improved on the Opportunity Index, an annual composite measure of 16 key economic, educational and civic indicators that expand or constrict access to economic mobility.